The following images were taken during the March Digital Photo Academy advanced class. I went into the day wanting to play with minimal depth of field and a lot of blur. I never shoot flowers in the editorial assignments that come my way. However, with the weather in Minnesota the Como Park Conservatory is a great place to spend a few Winter hours. 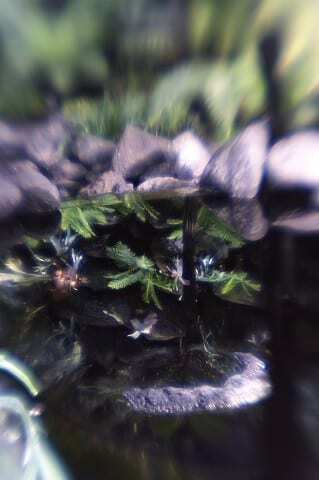 The first group of images were shot with a Lensbaby. It is basically a special lens on a flexible tube, in which you can control selective focus for your SLR camera. In order to focus you need to push it in or extend it. You can also move the in focus “sweet spot” by bending it up and down or left and right. I was using an aperture of 2.8 for minimal depth of field and playing with the Lensbaby′s bend to get a lot of blur. The camera was set to manual mode. I wanted to focus on a single pedal, anther, or stigma of a flower and get a wash of color everywhere else. The next 8 images were the result of experimentation with foreground and background blur.In the following three images I used other flowers, leaves, or feet, to frame the flowers and building I was focusing on. The blurred tones are a result of using an aperture of f/2.8 on the 14-55 lens attached to my Lumix L1. This technique helps to bring the viewers eye to the isolated subject. The last five images are and example of blur or shallow depth of field in the background. Again an aperture of f/2.8 was used on the Lumix L1.Using this shallow depth of field lets the viewer of the image see the atmosphere or environment the subject is surrounded by. Yet, the blur of the surrounding area doesn′t distract from the in focus subject. You can see the difference between isolating the subject against a black background as in the last image and including the environment displayed in the other four in this group.You can use this same technique on portraits too. Most of the assignments I get are environmental portraits for magazines. I use these same techniques to add visual impact to those images as well. It helps make your images tell a story.